BANGI, 4 December 2014 – It is up to the local research universities to determine whether international rankings agencies had taken into account development of relatively young institutions like The National University of Malaysia (UKM), Universiti Malaya (UM) and other institutions from emerging nations in their annual report. 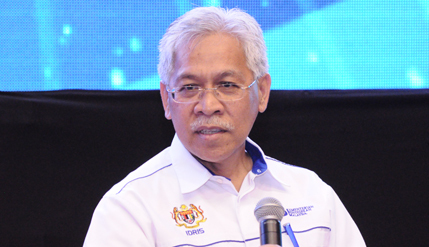 Second Education Minister Datuk Seri Idris Jusoh said public institutions of higher learning may review their links with the rankings agencies if they feel that the grading systems have been unfair to universities in developing countries. “It takes time for relatively young universities like UKM and other local institutions to get the acknowledgement that they deserve from such rankings agencies,” he told UKM News Portal after officiating the 5th media conference and exhibition on the achievements and success of Malaysia’s five research universities, here today. Datuk Seri Idris was asked to comment on an online media report recently about Universiti Teknologi Malaysia (UTM) being the only local institution that made it to the list of the top 100 universities in emerging economies for 2015, according to Times Higher Education (THE) rankings. THE expressed concern that some of the Malaysian universities had not sent their updated data to enable it to rank them. According to THE, UTM was number 93 in THE BRICS and Emerging Economies Rankings for 2015, but UKM and UPM which featured in last year’s rankings at number 77 and 95, respectively, did not make the cut this time. BRICS refers to Brazil, Russia, India, China and South Africa. Datuk Seri Idris said some of the Malaysian universities felt that THE used parameters that were not fair to them, such as the number of years established and the amount of endowment. THE was reported to have said in a statement that the universities had not engaged enough with it. The second education minister had earlier urged research universities to continue producing more researchers who can impact the community, industry and country. Datuk Seri Idris said since the inception of research universities in 2007 they have so far produced 25,000 Doctor of Philosophy (PhD) degree holders. Also present were Vice-Chancellor Prof Datuk Dr Noor Azlan Ghazali and Higher Education Director-General Prof Datuk Dr Asma Ismail. At the event, the Sime Darby Foundation (YSD) presented UKM with a cheque for RM5 million for further joint-venture research. YSD had previously granted funds to UKM’s zero-waste programme through an endowment of the UKM-YSD Chair for sustainable development and the UKM-YSD Chair for Climate Change. The cheque was handed over to Deputy Vice-Chancellor (Research and Innovation Affairs) Prof Dato’ Dr Mazlin Mokhtar by head of YSD Processing Technology, Shawaluddin Tahiruddin. A book authoured by Prof Asma titled ‘Impact of Malaysian Research Universities as the Engine of Growth for Nation Building’ and UKM’s indigenous fuel cell golf buggy were launched at the event.